Staining according to Neisser is a test for the presence of polyphosphates stored in the cells (= storage materials). This method is an indispensable aid to the identification of certain strains of filamentous bacteria. Furthermore, this staining method can make the Bio-P bacteria, responsible for biological phosphate removal, visible. · Prepare a fixed smear. · Place a freshly made mixture of 2 parts solution A and 1 part solution B onto the slide for a contact period of 10-15 seconds. Afterwards, allow the excess dye to run off the slide. · Add solution C for a contact period of 45 seconds. · Rinse the slide with tap water (with the flow against the back of the slide). · Allow the slide to dry and then view with a 100x bright field objective. Drying can be speeded up by removing most of the water carefully with filter paper. Neisser negative cells stain hardly or not at all (slightly brown or yellow; Three main groups of Neisser positive bacteria can be distinguished. 1. 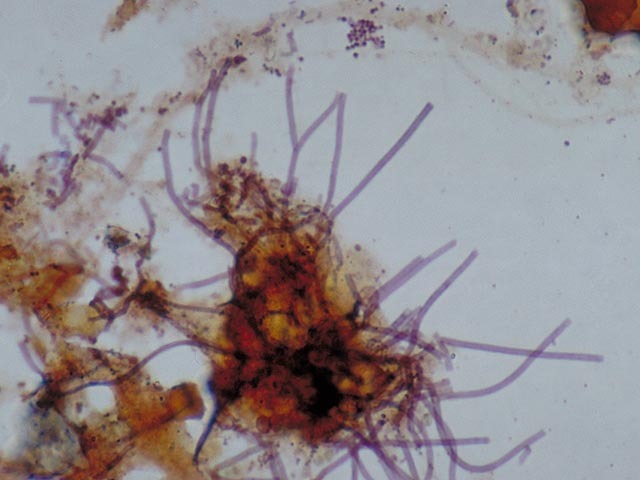 Filamentous bacteria which stain completely grey-violet . This almost always applies to Nostocoida limicola or Type 0092. 2. 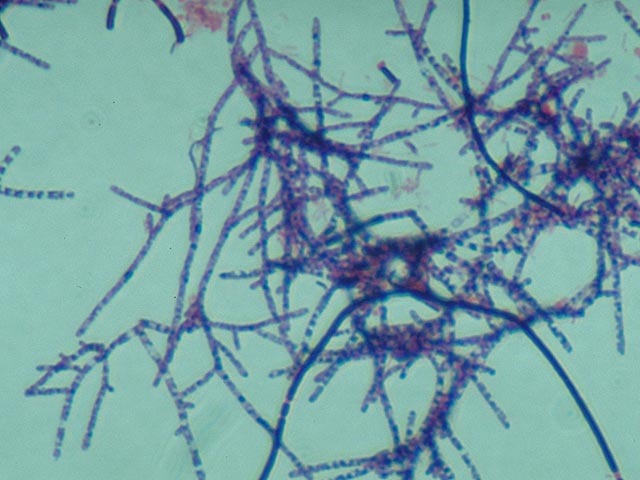 Filamentous bacteria which contain blue-black coloured polyphosphate globules . Without staining, these globules cannot be clearly observed with a light microscope. They are indeed clearly visible if a much higher magnification (electron microscopy) is used . These globules, which are present in pairs, are an important identification characteristic for Microthrix parvicella. 3. Colonies of blue-black coloured cells . These are comprised of Bio-P bacteria. There are some variations in the manner in which these types of colonies stain with Neisser. The shade is sometimes much lighter , or only a part of the cell stains darkly. Gram staining is an indispensable aid when identifying bacteria. This staining first colours the bacteria blue using carbol gentian violet. The cells are then washed with an alcohol solution. The cells of some bacterial strains re-release the absorbed blue dye during this process. These bacteria are known as Gram negative. In the case of Gram positive bacteria, the absorbed carbol gentian violet cannot be removed by washing with alcohol. The colourless Gram negative bacteria are subsequently restained with safranine, which gives them a red colour. This is the result of differences between Gram positive and Gram negative bacteria in the composition of the cell wall. A Carbol gentian violet solution Dilute 10 ml of the stock solution with 90 ml of a 5% phenol solution. B. Lugol’s iodine solution Dissolve 3 g KI in a few mls of distilled water, mix in 1 g I2 and dilute to 300 ml with distilled water. C. Alcohol solution Dilute 7 ml of the stock solution with 1000 ml (96%) alcohol. D. Safranine solution Dissolve 0.25 g safranine in 10 ml (96%) alcohol and dilute with 100 ml distilled water. · Prepare a fixed smear (see paragraph 2.3). · Apply solution A for a contact period of 60 seconds; subsequently allow the excess dye to run off the slide. · Apply solution B for a contact period of 60 seconds; subsequently allow the excess dye to run off the slide. · Dip the slide in solution C for 30 seconds. Move the slide gently to and fro in this solution. · Rinse the slide clean with tap water by allowing the water to flow gently over the back of the slide. · Apply solution D for a contact period of 120 seconds; subsequently, rinse the slide again with tap water. · Allow the slide to dry and view with a 100x bright field objective. A blue filter strengthens the contrast. Drying can be speeded up by first removing most of the water with filter paper. 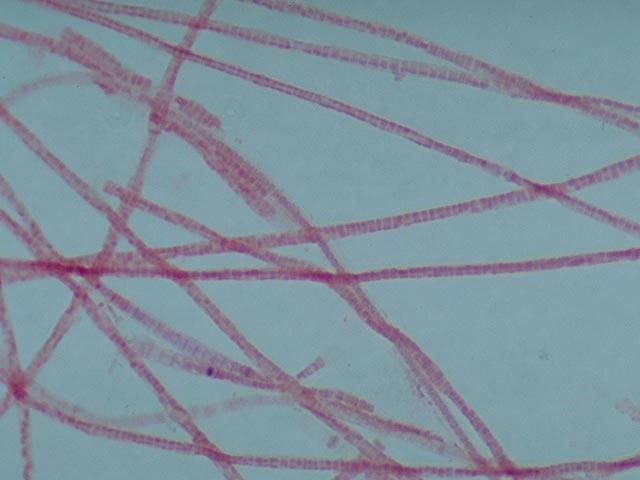 Gram negative and Gram positive bacteria stain red and blue, respectively (Figs 2 and 3). The blue colour can vary from light blue to almost black. Sludges from high loaded plants are mostly comprised of Gram negative bacteria, while many Gram positive strains are also present in sludges from lower loaded plants. The presence of Gram positive species contributes to a more robust floc (see also paragraph 4.1).Fungi and protozoa/metazoa do not stain evenly, or not at all, with this staining method. 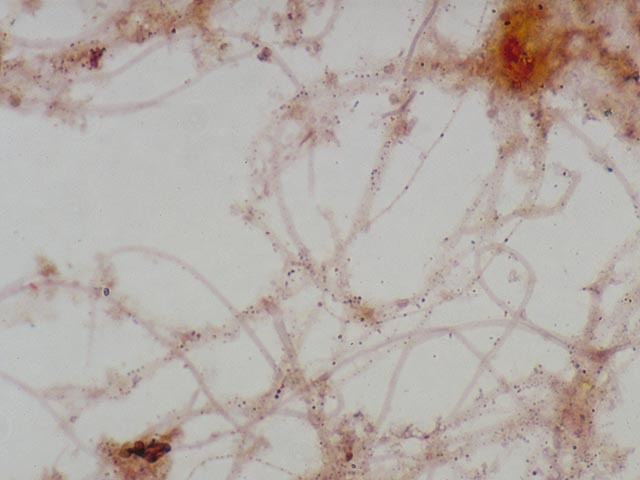 For some filamentous bacteria, particularly Type 0041, not all parts of a filament stain in the same manner. This is usually caused by the attachment of other bacteria to the filaments. 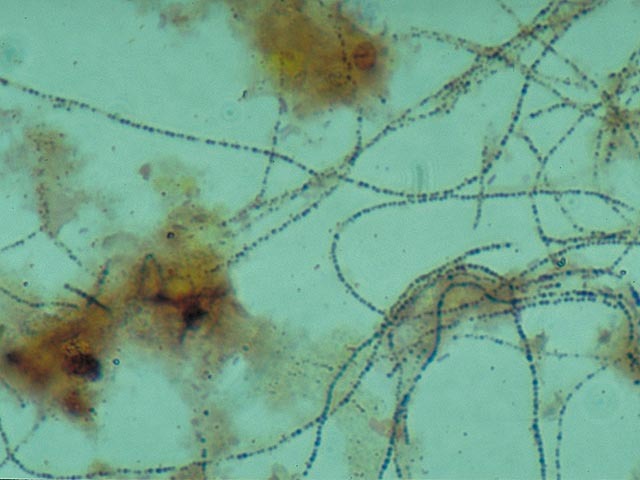 These bacteria screen off the filaments to some extent so that the blue stain cannot be sufficiently absorbed. When assessing the result of the staining in such a case, attention is principally paid to the 'clean' tip of the filament. The result of the staining depends upon the age of the cell for some species. Young cells stain red whereas older ones stain blue. This can also result in two colours occurring in one filament. · The solutions can be bought ready made. · Numerous different recipes for Gram staining are mentioned in the literature. The recipe described provides filamentous organisms with a good contrast. · Most solutions can be retained for an almost unlimited time. Solution C (not the stock solution) must be renewed once a month. · The slides must be properly de-greased. · The slides must be viewed with bright field. The difference between red and blue is less clear with phase contrast. · The slide must not contain too many sludge particles, as excess dye can then no longer be removed by rinsing. Large 'blobs' of dye can be seen when viewing. If this is the case, the staining must be repeated with fewer sludge particles on the slide.